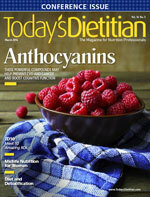 For the past five years, Today’s Dietitian has asked readers to nominate colleagues who they believe have accomplished incredible feats in the dietetics field, who have gone above and beyond what’s expected of them to spread nutrition messages, establish new trends, lead movements, and help the underserved lead healthier lives. Each year, all the wonderful successes you have in the nutrition profession continue to amaze us, making it increasingly difficult to select only 10 winners from such an exceptional pool of high achievers. Dietitians represent nutrition in many different areas and in many different ways. Some work with underprivileged populations, the elderly, and children. Others tirelessly investigate our food sources and sustainable food systems and provide nutritious meals to those who don’t have access to them. And still more are making great strides in the areas of education, policy reform, research, and engaging one another as they advance the profession. In honor of National Nutrition Month® and Registered Dietitian Day, Today’s Dietitian has chosen 10 exemplary dietitians who deserve recognition for their exceptional work in the field. We hope you enjoy their stories and become even more inspired to continue the incredible work you do each day. Melinda Hemmelgarn says she always has been one to ask the why questions, so it makes sense that she now is best known as the award-winning Food Sleuth columnist and radio show host. After gaining more than 30 lbs for no distinguishable reason, Angela Grassi saw three different physicians who each told her just to watch her diet more closely. She already was doing intense workouts and, as a dietitian, knew her diet shouldn’t have promoted that kind of weight gain. After much frustration, Grassi finally wound up seeing a polycystic ovary syndrome (PCOS) expert who confirmed she had PCOS, even though she didn’t have some of the telltale signs that might have brought a quicker diagnosis. It was a life-changing moment in many ways. As many as one in 10 women of childbearing age have PCOS, but for many it goes undiagnosed. Grassi seeks to change that. “I knew that when I wanted to educate other professionals that a key way to do that would be a book,” she says. The second edition of PCOS: The Dietitian’s Guide just came out, and she’s working on her first cookbook. Now Grassi is involved with getting a study under way that will look at the relationship between gluten and PCOS to determine whether women with PCOS also are gluten sensitive. Having grown up on a farm, Jan Patenaude says she always has “known where food came from—and it wasn’t a box or a package.” Her family grew its own vegetables and raised cattle and chickens, and her father hunted and fished. Her interest in food led her to a restaurant management program that she started as a senior in high school. But during her first full year of college, she had to take a required nutrition course and says she instantly was hooked. She switched to a dietetics degree and never looked back. Patenaude says what she’s loved most about being a dietitian has been the freedom and the variety the profession offers. She has worked in hospitals, long term care, prisons, and home health care, and she has served as a speaker at industry meetings. Now with Oxford Biomedical Technologies, Patenaude works to educate others about the LEAP (Lifestyle Eating and Performance) diet protocol, which is designed to reduce clinical and subclinical inflammation in conditions such as irritable bowel syndrome, migraines, eczema, and chronic rhinitis. Jo Jo Dantone-DeBarbieris began her schooling as a religious education major at a Baptist university, with plans of serving the Lord as a counselor. But she found that she struggled with the major. As much as she’d thought religious counseling was meant to be her calling, she says the Lord ultimately led her elsewhere. During a discussion with her mother’s best friend (a dietitian), Dantone-DeBarbieris realized dietetics really was the path meant for her. That’s also where Dantone-DeBarbieris was first exposed to geriatrics. Today, as the president and CEO of Nutrition Education Resources, she provides consulting services to a large number of nursing homes, hospitals, home health agencies, correctional facilities, and even child nutrition programs. She also works in an HIV clinic. In addition to a passion for geriatrics, she has a special interest in diabetes education after her own diagnosis 20 years ago. From a very young age, Maria Caranfa enjoyed being around food and was curious about creating healthful meals. When she was 10 years old, she cocreated an at-home “restaurant” that family members would visit. The menu was filled with flavorful options such as “magic fried chicken” that was baked instead of fried and various pastas filled with garden-fresh vegetables. Caranfa attributes her passion for food to both her mother and grandmother, and says it was no surprise that she wound up in the restaurant industry. As the nutrition program manager for Bloomin’ Brands, a portfolio of five leading restaurant brands, Caranfa helps teach and consult the 80,000-plus team members who comprise the organization. Supporting seniors to live independently has been a major focus for Shirley Y. Chao for the past 20 years—long before aging in place or home health care became a growing trend. As the director of nutrition for a statewide elder nutrition program, Chao has helped raise the quality of nutritious meals served while also keeping it cost-effective. Her efforts have supported the program for 20 years, eliminating the need for a permanent waiting list that can force seniors who qualify for meals to have to wait for months or even years because of a lack of funding. Chao also helps uphold standards, inspections, and training to ensure food safety and provides nutritious meals to improve the health and lives of approximately 75,000 seniors each year. Her daily responsibilities range from financial contract negotiation to policy recommendations. She also helps set policy that directs the local programs and ensures individuals meet eligibility requirements to receive meals. This year, the organization started several new statewide initiatives, including a breakfast program, weekend frozen meals, therapeutic meals, and nutritional supplementation. Chao has proven to not only be a statewide leader but a national one as well. She has served as chair of the Healthy Aging Dietetic Practice group and is on the board of the National Association of Nutrition and Aging Services Programs. Throughout her career, she has helped influence policy such as the Older Americans Act. Silvia Benincaso became interested in nutrition and its role in health and wellness—particularly in the treatment of disease—as an undergraduate at Rutgers University in New Jersey. In 1992, she was commissioned as an officer in the US Public Health Service and has been stationed with the Indian Health Service for her entire career as an officer. While working and learning about the health concerns of Native Americans, it became clear to Benincaso that the rate of nutrition-related diseases was very high, yet there were few RDs who worked within Native American communities. Even more troubling, she learned that only 0.3% of all RDs were from American Indian or Alaska Native tribes, despite the well-known fact that individuals learn best from people who understand their culture. Benincaso felt compelled to make a change. That change would come through education. At the time, the Indian Health Service didn’t have a dietetic internship program. Benincaso and her supervisor, CAPT (retired) Edith Clark, began investigating what designing such a program would entail. Partnering with Kayenta Service Unit, another Indian Health Service facility, a 33-week (now 40-week) accredited dietetic internship program was formed. The program provides housing during the six-week (now seven-week) rotation in which interns can immerse themselves in Navajo culture. To date, 13 interns have graduated, and nine are employed in programs serving American Indian people. Although Paul Moore works full-time at a hospital-based wellness center, where he serves as the facility’s assistant director, he finds time to fit in a variety of other roles, including teacher and volunteer. As an adjunct instructor at Appalachian State University, Moore enjoys teaching a general nutrition course and encouraging students to make life-long healthier choices. But the course he enjoys teaching the most is “Nutrition for Children,” which often is inspired by his experiences as a father of two young kids. Currently, Moore also serves as the 2013-2014 North Carolina Dietetic Association (NCDA) president and volunteers as an editor for the Weight Management Matters newsletter, published quarterly by the Weight Management Dietetic Practice Group. Though he’s busy with his full- and part-time jobs as well as his family, Moore says he believes in the importance of dietitians becoming more involved in professional associations and outside opportunities. That’s why he’s taken an active approach to engaging more NCDA members. One major change has been switching from one annual meeting (two to three days in length at one location) to four, one-day meetings held across the state and throughout the year. “We’re also trying to connect members with a monthly webinar so that regardless of where they live or how busy they are, they can still be engaged,” he says. Susanne Trout’s career shows the true versatility of a dietetics degree. She once served as a site coordinator for a pediatric bariatric group at Texas Children’s Hospital, where she helped build one of the first adolescent gastric bypass programs in the country. Before that, she worked in the hospital’s neonatal ICU (NICU), where she developed an interest in breast-feeding and became a lactation consultant. Recently, however, she moved to Arizona and into the area of health and wellness. As a full-time dietitian with North Carolina State University, Lisa Eberhart hasn’t only changed the way students eat but the way they perceive food. She has proven that even minor changes can make a dramatic difference in students’ nutrition, as one healthful choice often leads to another. Putting fruit and vegetables in prominent positions, changing milk from 2% to 1%, using turkey in place of beef, and switching from white to wheat bread are just a few healthful changes students on campus readily are accepting. But Eberhart also is especially proud of the food labeling program. She says North Carolina State has one of the best allergy marking systems among universities, and that allows students with allergies to feel comfortable making safe dining decisions. The campus offers iPads that enable students to sort menu items by allergen, she explains. For instance, if students have a peanut allergy, they can select the peanut icon to bring up a list of safe foods they can eat.